A forgotten animated classic from the 1980’s, resurrected by the power of DVD. Most people don’t seem to remember this movie, and with good cause. It went in and out of the theater with a whimper, despite the loud music, and was soon filed away into obscurity on Blockbuster Video shelves, doomed to forever be overlooked solely because it was alphabetically located next to Robocop. 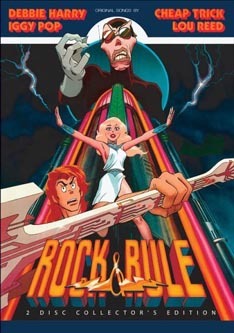 Rock & Rule isn’t going to be for everyone, there are a few prerequisites: you have to like animation, you have to be an adult, you have to like 80’s rock and you have to like post-apocalyptic B-movies. Talk about a niche market. In a post-apocalyptic future of some sort, animals have been mutated into anthropomorphic humanoids and co-exist with everybody else. Oh, and they like to ROCK! Omar is the lead singer of an up-and-coming rock band that just can’t seem to catch a break. Luckily, his lovely girlfriend, Angel, who has an even lovelier singing voice, is there to support him. The villainous Mok, a rockstar of legendary proportions, has devious plans to open a gateway to another dimension and summon a monstrous demon. However, rock & roll music is the key to opening the gateway and the only person with the proper angelic voice is…Angel! Mok kidnaps Angel and spirits her away to Nuke York for the ritual. Omar and the rest of the band head out to her rescue. Right away you should be able to tell that this is a silly movie. I mean, “Nuke York”? But Rock & Rule’s sense of humor is one of the more charming aspects of the film. Of course, in keeping with the rock n’ roll trends, this movie contains the typical contempt for authority (cops are portrayed as power-tripping imbeciles) as well as a loathing for bubblegum music and girly pop. As a fan of heavy metal and rock n’ roll, I couldn’t agree more. Now, perhaps the biggest draw of the film would have to be the music. You’ve got a nostalgic soundtrack featuring the likes of Iggy Pop, Cheap Trick, Lou Reed, Debbie Harry, Blondie and Earth, Wind & Fire. Quite an A-list of musical contributions, or at least it was at the time. Can’t say I appreciate all the bands featured in the movie, but I do like most of them. Mok’s song will stick in your head for the next twenty years, particularly the chorus of “His name is Mok, thanks a lot!” Gah! The animation was produced by Nelvana Studios in Canada, the same people that did the animated segment of the Star Wars Holiday Special and the Beetlejuice cartoon series. The animation is actually really good, considering this was produced in 1983. The action sequences are rather impressive and the “music videos” are done with some flare. The summoning of the demon at the finale is probably the best part in regards to the visuals. This film isn’t for the younger kids, as it contains a lot of adult humor, but it’s got an accurate PG rating. Save for some skimpy outfits, a few swears, scary demons and loud rock, it won’t traumatize any youngsters. They’ll probably like the music, at any rate. Rock & Rule is deserving of a B-. It’s a nostalgic trip down memory road, but it will only appeal to a select market and even then it’s not entirely memorable.